Though the debate over the name of the Federation had been settled and a unanimous decision to change was announced at the convention in September, this continued to be a topic of discussion throughout 1932. 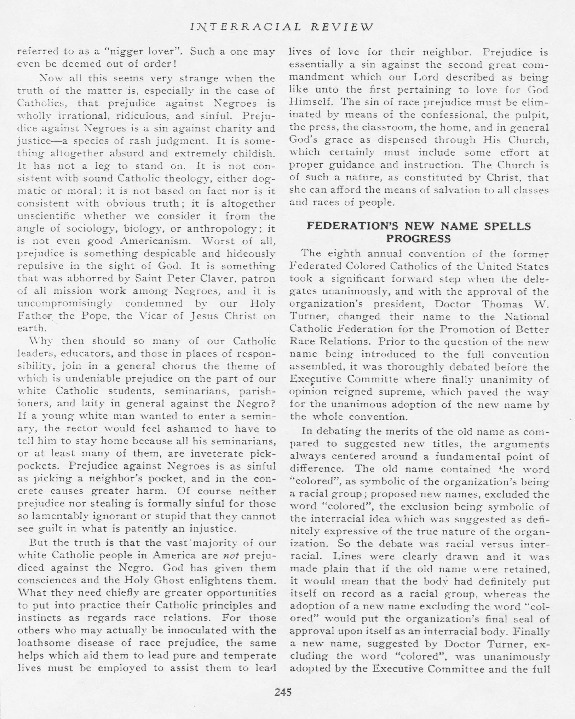 In the December 1932 edition of the Interracial Review, the editors expressed their approval of the Federation's name change as a "decidedly progressive and forward step." What was the central issue in the debate over changing the Federation's name? According to the author, how would the organization's name change affect its perception by the public? How, if at all, could the name change affect the goals or actions of the organization? Consider the definition of the term catholic. Explain how the new name is "truly Catholic."